Few in the United States will dispute the assumption that every high school graduate should be entitled to go to college regardless of financial need. But should everyone be able to go regardless of academic preparedness? 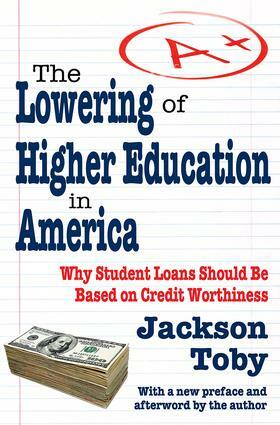 Jackson Toby explores the idea that federal financial aid programs, all of which peg student aid to need alone and not to academic performance, are dragging down college admissions and academic standards to the point where America's schools, students, and economy will no longer be globally competitive. After a half-century of teaching, distinguished educator Jackson Toby concludes that our current system all too often gives both high school and college students the impression that college is an entitlement and not a challenge. The Lowering of Higher Education: Why Student Loans Should Be Based on Credit Worthiness is Toby's unflinching look at this broken system and the ways it can be fixed. This volume documents just how far college admission standards have fallen and measures the cost of remedial programs designed to get underprepared high school students to the level they should have been at in the first place. Toby is both pointed and frank in his discussion on the issue of grade inflation, which rewards laziness while demoralizing hard-working students. To reverse the national decline of academic standards in American colleges, Toby proposes a radical solution: Let federal student aid be tied to academic performance as well as financial need, incentivizing students to develop serious attitudes and study habits in high school and keep them up in college. Is College Graduation Enough for a Good Job, or Do College Graduates Have to Know Something?